The true apex of the frog should be found by carefully trimming the frog until the line of dirt between the frog and the sole begins to disappear and the "seam" between the sole and the frog is seen. Following laminitis, the frog often stretches forward. A line dropped down from the hairline at the toe will usually indicate the approximate position of the true apex of the frog. What is thought to be the apex of the frog should be marked when radiographs are taken so that the true and actual frog apex can be compared. In the diagram on the right, four months after laminitis and rotation the frog had stretched forwards. Radiographs were taken with the actual frog apex marked with a drawing pin, and the hairline at the toe marked. On the radiograph the actual apex was clearly too far forwards - the true apex of the frog is always behind the tip of P3. On the radiograph a line was dropped down from the hairline at the toe (brown line) to indicate the approximate position of the true apex. A photograph of the sole taken at the time of the radiograph was adjusted to the same scale as the radiograph, and the brown line suggesting the position of the true apex projected onto the photo of the sole. This helped to guide the farrier's exploration of the true apex. 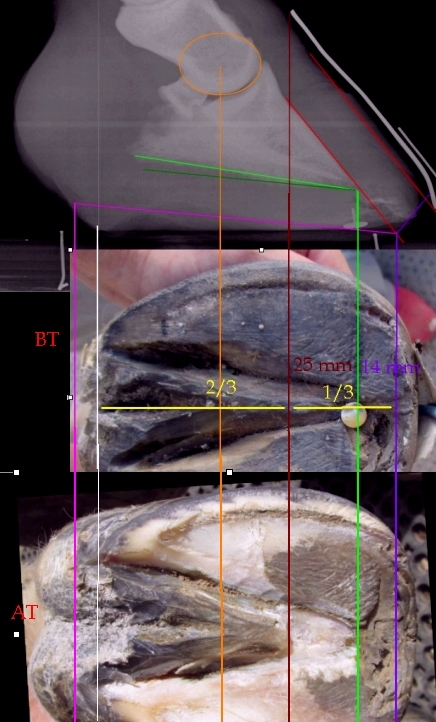 By gently scraping back frog material, the farrier found the clear seam between the sole and the frog - the true apex - as shown in the bottom photo of the sole (brown line). When correctly trimmed, approx. 2/3 of the foot will be behind the true apex, and 1/3 in front of it. The frog stretching forwards like this is often the reason that horses' toes are left too long. Robert Bowker has suggested that the bars have tertiary as well as primary and secondary epidermal laminae, and that the bars' laminae "appear able to form tubular horn and contribute cells to the growth of bone the hoof wall and the sole". "Recognizing deformity or malfunction in the bars may turn out to be an important first step in restoring symmetry and function." Gene Ovnicek suggests that breakover should be around 1/4" in front of the tip of P3. Bruising in the hoof wall - this pony had had laminitis, but also had a change of angle in the hoof wall and flaring. See also White Line - Bruising/blood in the white line - below. Red colouration indicating bruising may be seen on white hoof walls and soles, or in the white line. When small blood vessels break in the sensitive tissues of the foot, blood seeps out into the surrounding tissue, and if trapped between the hoof wall or sole and the tissue, it cannot be absorbed and will grow down with the hoof wall/sole, eventually being seen as a bruise. A sole bruise may be seen approx. 4 to 8 weeks after the injury occurred. A bruise on the hoof wall or in the white line may be due to injury to the laminae or coronary band, and may be seen up to 9 months after the injury occurred. Bruises from coronary band injury may be hidden by the periople initially so may not be seen until several weeks after the injury took place. Bruising may be caused by laminitis, but also by poor foot balance or by trauma/injury to the foot or coronet. ​"Most of the time the width of the true sole in front of the frog will be about 1/3 of the overall length of the frog" - p 344 Care and Rehabilitation of the Equine Foot - Pete Ramey. 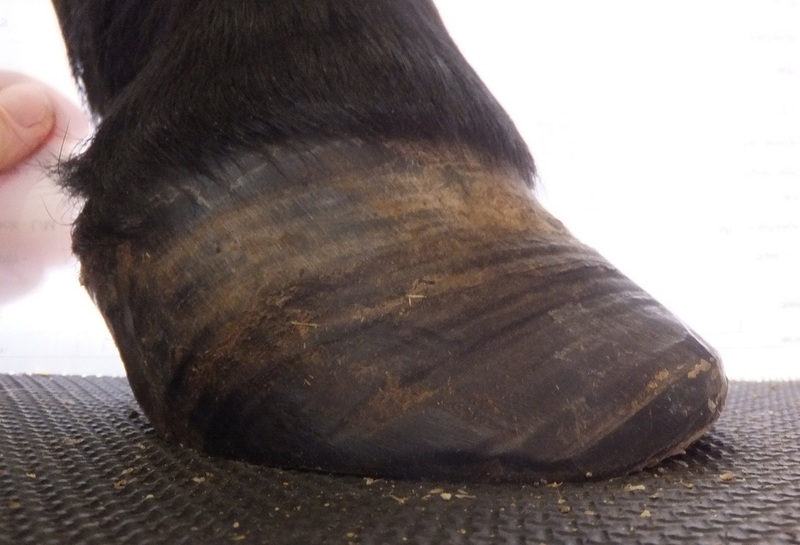 Lots of examples, including video, of horses landing heel first, and why it is so important. What are underrun heels ? from HUFCHECK media on Vimeo. The hoof pastern axis compares the angle of the pastern bones to the angle of the toe/pedal bone (the toe should always be parallel to the dorsal surface of the pedal bone). There should be a straight line through the bones. Proper Physiological Horseshoeing: What is it? How Do We Apply It? - Stephen E O'Grady - AAEP 2009 - article shows a parallel HPA, a broken back HPA, and describes broken back and broken forward HPAs (inclusion of this article should not be taken as endorsement of the shoeing methods described). The distance between the dorsal surface of P3 and the outer surface of the dorsal hoof wall is called the H:L zone or horn:laminar zone or wall thickness. The H:L zone may widen with conditions that affect the laminae and wall thickness, such as laminitis (the lamellar zone widens) and white line disease (the horn zone widens). The H:L zone can only be measured accurately if the inside (medial quarter) of the foot was in contact with the x-ray cassette when the lateral (LM) x-ray was taken so that there is no magnification, or if the image has been corrected for magnification. 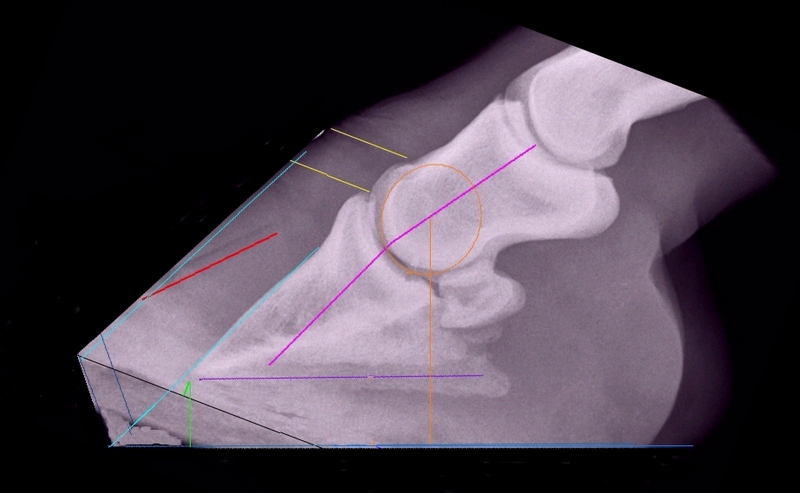 "The thickness of the H:L zone will be randomly and unpredictably magnified when the medial quarter is not touching the cassette during image acquisition" (p 240 Care and Rehabilitation of the Equine Foot 2011 - ch. 13 Radiographic Imaging of the Laminitis Patient - Dr Debra Taylor). The dorsal hoof wall must be accurately marked with radiopaque material such as barium for H:L zone measurements to be accurate. The H:L zone is measured with the ruler at 90 degrees to the dorsal surface of P3, and can be measured anywhere along the dorsal surface of P3, but usually proximal (just below the extensor process) and distal (just above the tip of P3) measurements are taken and recorded e.g. 18/18 (proximal/distal). In an adult foot with no rotation, the proximal and distal measurements should be the same. In a foot with rotation, the distal (lower) measurement is likely to be greater than the proximal (upper) measurement. Linford et al 1993 suggested that wall thickness in the normal horse is less than 30% (25 - 30%) of the length of the palmarcortical (PCL) of P3. Light breeds e.g. Quarter Horse, Thoroughbred 15-16 mm (Clinical and Radiographic Examination of the Equine Foot, RF Redden, AAEP 2003). Standardbred 20 mm (Clinical and Radiographic Examination of the Equine Foot, RF Redden, AAEP 2003). Thoroughbred 16.3 mm (Cripps and Eustace 1999). Dareh-Shori horses (Iran) 17.1 mm (Vali R 2014). The H:L zone measurement will depend on the size of the foot - "an appreciation of the range of normal for that type and size of horse is essential for accurately interpreting this area" (Clinical and Radiographic Examination of the Equine Foot, RF Redden, AAEP 2003). A mustang foot photographed, measured, x-rayed and dissected. The horn-laminar zone was 22 mm and of uniform thickness. It is suggested that "the wider HL zone in mature mustangs relative to light domestic breeds (15/15 mm) is due to the thicker hoof wall, which is about 2x the width of the dermal laminar zone (7.5 mm) (ref. Dr. Ric Redden). The HL zone is these horses usually reverts back to 15/15 mm several years after domestication." In comparison, a 5 year old domestic mustang had a HL zone of 20/18 mm. Pete Ramey has before and after photos and x-rays of a horse with rotation and a lamellar wedge (figs 5 - 10) in his article Reversing distal descent of P3. Horses with navicular are sometimes diagnosed as having laminitis, and vice versa. Foot care for both laminitis and navicular have a lot of similarities, such as having the hoof capsule correctly aligned to the pedal/coffin bone, ensuring the foot is well protected/cushioned and that the horse is comfortably walking heel first. Barefoot rehabilitation appears to be very successful, as shown by the many successful rehabilitations from navicular by Rockley Farm. 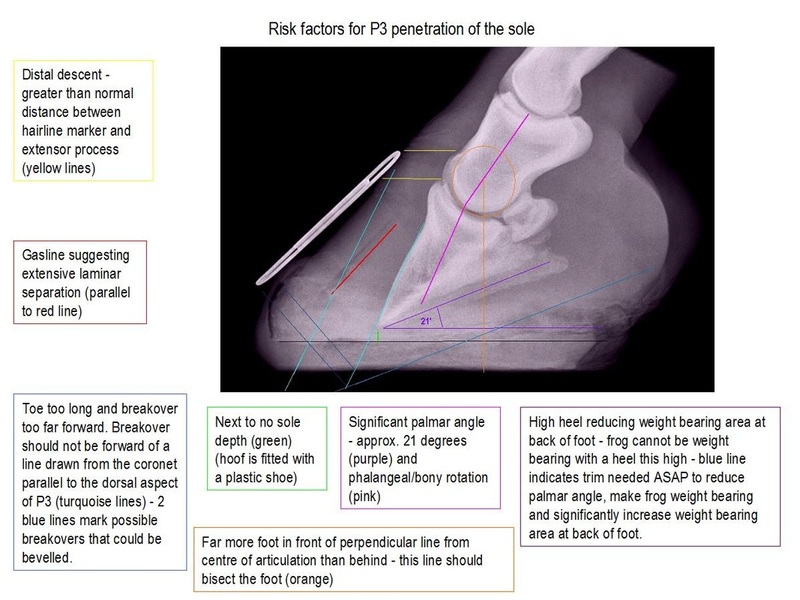 "Most of the time the width of the true sole in front of the frog will be about 1/3 of the overall length of the frog" - p 344 Care and Rehabilitation of the Equine Foot - Pete Ramey. 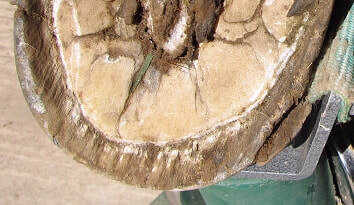 Hoof rings or growth rings are seen as minor lines in healthy hooves and are thought to be due to variations in nutrient content of the diet, particularly grass/forage. Slight colour variations are seen, but the hoof wall remains reasonably smooth with no significant change in texture. 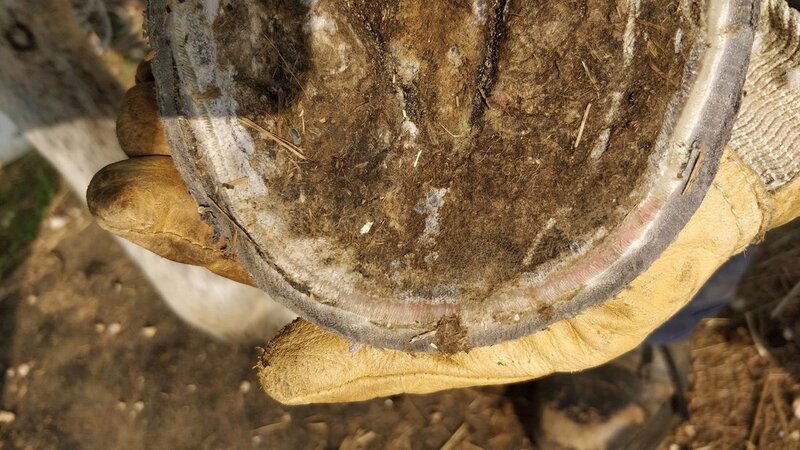 Hoof ridges or fever rings can be seen and also felt as a distinct bump or ledge on the hoof wall, and are through to be suggestive of a systemic health problem, such as fever, laminitis, infection or toxicity. Often by the time the ridge is seen, the problem has been resolved. Do shoes have a place in laminitis rehabilitation? Possibly. Every horse, every situation is different, and what works for one horse may not work for another. The most important part of foot rehabilitation following laminitis is trimming the hoof capsule to realign it with P3, thereby restoring P3 to its correct anatomical position. Hoof boots and pads have developed significantly in the last few years and can usually be adapted to fit most rehabilitation scenarios. "Pressure distribution showed wedges and studs to cause an increased pressure load on both the toe and the heels on a firm surface. Rocker shoes led to pressure peaks at the inner section of the toe, and high pressure was exerted on the quarters. In conclusion, all modified horseshoes showed unintended side effects and their influence on biomechanical parameters varied depending on the ground surface." Heart bar shoes may remove the frog from action and lead to atrophy. Popular in Europe, the reverse shoe is a normal shoe fitted backwards, i.e. with the toe of the shoe under the heel of the horse, the idea being to bring breakover back and to remove forces on the laminae at the toe. However, if a realigning trim is not correctly carried out before the shoe is fitted, the shoe is unlikely to alter forces on the laminae to any great extent, and does not support P3 (see Care and Rehabilitation of the Equine Foot p244). Pete Ramey says that "the sole of the horse is the most important consideration in trimming" (Care and Rehabilitation of the Equine Foot p 284). The sole is the barrier between the corium of P3 (the pedal/coffin bone) with its nerve and blood supply, and the ground, which may be hard or stony. The sole grows from the solar corium (tissue containing blood vessels and nerves) on the solar surface (bottom) of P3 - see Horse Hoof Anatomy - www.all-natural-horse-care.com for a hoof dissection showing the solar corium. The circumflex artery supplies blood to the sole, and lies close to the sharp solar edge of P3 - blood from the dorsal surface of P3 curls under the sharp edge of the bone to join the circumflex artery - see Colour Atlas of the Horse's Foot by Christopher C Pollitt, pages 19 - 24. The solar corium with its blood and nerve supply lies between the hard pedal/coffin/P3 bone and the epidermal sole (and the ground), and is vulnerable to damage from compression. Compression from the descent and/or rotation of P3 (or any excess/constant pressure on the sole) can cause the sharp edge of the bone to reduce or cut off the blood supply to the solar corium, resulting in severe lameness and in some cases leading to necrosis of the sole (necrosis is defined as irreversible cell or tissue death from external factors - lack of blood supply can cause necrosis). For more websites showing the anatomy of the horse's foot including blood supply and sole corium, see Anatomy. Slight rotation/descent of P3 can cause the sole to change from concave to flat. Blood vessels in the solar corium can be crushed by the sharp bottom edge of P3 and cause haemorrhage (NB use of medications that affect blood clotting, e.g. aspirin, can make haemorrhage more likely to occur), which may eventually appear as a crescent-shaped bruise as the sole grows down to ground level. After several weeks the tip of P3 can remodel and appear "ski-tipped" in lateromedial x-rays. More significant rotation/descent of P3 can cause a convex bulge in the sole ("dropped sole"). 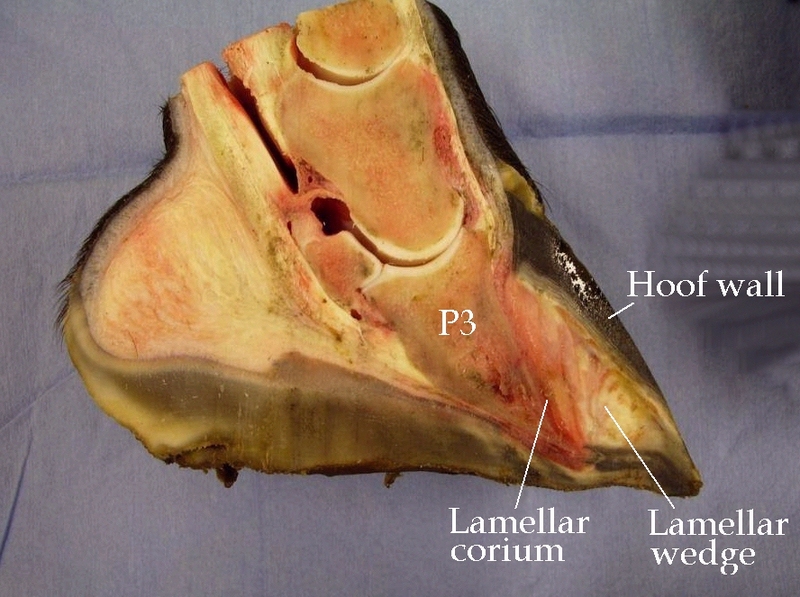 The tip of P3 can crush the corium of the sole causing necrosis of the sole, and in severe cases P3 can prolapse/penetrate through the sole, often causing infection - abscess formation and infection of the bone (osteomyelitis). The tip of P3 can start to disappear (osteolysis). It is suggested that the hoof may grow inward towards the tip of P3, contributing to further rotation. The soft tissue and blood vessel compression and destruction of the bone is likely to cause significant pain and lameness, and can lead to incurable damage. In time new yellow sole should replace the red necrotic solar corium under the tip of P3, and the reappearance of thick, concave sole is encouraging. A correct realigning trim (above), protection and support of the foot and removal of the factors causing laminitis should generally prevent significant rotation (left) turning into P3 penetration of the sole (below). to relieve pressure on the exposed area. The x-rays above show how trimming to lower the heels can immediately change a foot from one with significant pressure on the tip of P3 with subsequent compression of the sole and solar corium and the majority of weight being born on detached walls and at the front of the foot (above left) to one where the pressure on P3 is distributed widely and towards the back of the foot, and the majority of weight is being born at the back of the foot and shared by the frog, heels and bars (above right). Radiographs (x-rays) should be taken immediately any signs of changes in the sole are seen (lateromedial x-rays should always be taken following laminitis). The foot should be kept clean and disinfected, and probably covered/bandaged. Auburn University Cases - www.hoofrehab.com - 2 cases presented with perforations on the sole at the tip of P3. The Bars - Pete Ramey - www.hoofrehab.com - see photos dated 09/23/2006 and 11/3/2006 - before and after trimming of a hoof where P3 was lower than any part of the hoof wall and covered with only 3/16th inch of sole. P3 penetration in all 4 feet. His heels were lowered so that his frogs were weight bearing and his walls totally relieved from weight bearing. With frequent trims and good wound management, he was sound enough to go home after 4 months. Glynn - www.naturalhorseworld.com - P3 penetration in all 4 feet. Druid - www.ironfreehoof.com - note the gasline in Druid's x-ray. Concave but thin soles - being labelled "retracted soles" by some - may need careful trimming to avoid the feet becoming sore. Daisy Bicking suggests leaving more vertical height in the foot, not rolling the toe back too far into the callus, and protecting the feet with boots/soft pads. Thrush is very common in horses with laminitis, and is a common cause of lameness including what is often thought to be navicular disease - in fact according to Pete Ramey (Care and Rehabilitation of the Equine Foot p 305) it can cause chronic laminitis as the pain of thrush can cause toe first impact, thereby overstressing the laminae at the toe. Feet with a deep central sulcus, often a result of heel contraction, are particularly prone to thrush. Underrun contracted heels have caused a deep central sulcus with a deep-seated thrush infection. A healthy frog, shallow central sulcus, no signs of thrush. Thrush is an infection (bacterial/fungal) of the frog and its sulci. There is often, but not always, a distinctive "cheesy" smell, black or grey discharge and spongy frog material, but any frog sensitivity may indicate thrush - the frog is often very sensitive to slight pressure, meaning that the horse will not land heel first. Thrush can occur in wet or dry environments, wet alone is unlikely to cause thrush, although bacterial/fungal infections may be able to invade a soft frog more easily. The horse's environment should be kept clear of dung and urine, and a dry standing area provided - pea gravel is perfect for this, and provides stimulation for the frog. Always consider the diet when a horse has thrush. Poor diet - nutrient deficiency, mineral imbalance, excess sugar/starch - may affect the skin and hooves. Illness and stress may also have an impact on skin and hooves. Owners often report thrush clearing up when zinc and copper deficiencies (or iron overload) are addressed - nearly all forage diets are deficient in copper and zinc (and high in iron) unless minerals are supplemented. Frog stimulation and maximisation of circulation through heel first landing will reduce the incidence of thrush - the foot should always be trimmed to maximise heel first landing, and the use of boots with thick pads can often make the horse comfortable enough to walk heel first. Many treatments sold for thrush will kill living tissue as well as the pathogens causing the thrush, often making the problem worse. If you wouldn't use the product on a sensitive area of your skin, do not use it on your horse's frogs. Treatments that shouldn't be used include formaldehyde, hydrogen peroxide, bleach and iodine - see the last paragraph of Linda Cowles' article: Thrush Treatment Summary. Any treatment must get to the bottom of the sulcus. Soaking with Clean Trax or White Lightening. Mastitis medication, e.g. Albadry Plus (penicillin and novobiocin sodium). Pete's Goo - 50% triple antibiotic ointment and 50% athletes foot cream (1% Clotrimazole). NB antiobiotic creams cannot be sold over the counter in many European countries. TLS has had good results with No Thrush/NT-Dry - however use with care as this product is extremely drying. Any treatment must be coupled with correct trimming, frog stimulation, diet, environment and hygiene. If I only had 4 frogs - Dawn Willoughby - Easycare Inc. If there is laminar wedge, the position of the true toe (or where the toe should be) may not be obvious. Ideally x-rays should be taken and used to guide the trim. The true toe will run parallel to the dorsal surface of P3. 1. The 20-30 mm of hoof wall growth beneath the coronary band at the toe will often be "correct", i.e. parallel to the dorsal surface of P3, and this can be projected to the ground to show the true toe line. 2. Find the true frog apex. Approximately 2/3 of the length of the foot should be behind the true frog apex, and 1/3 in front. 3. Find the true frog apex. "Most of the time the width of the true sole in front of the frog will be about 1/3 of the overall length of the frog" - Pete Ramey, Care and Rehabilitation of the Equine Foot, p 344. 4. The hoof pastern axis may guide the position of the true toe - the toe should be parallel to the hoof pastern axis. A toe rocker (bevel) reduces separating forces and encourages a tight connection between the pedal/coffin bone and the hoof wall. The white line isn't white! When seen on the sole of the foot, the white line is a yellow/light tan colour. What looks like a white line is the stratum medium/inner hoof wall (sometimes called the water line). The white line is formed by the epidermal laminae (growing down past P3 with the hoof wall) and keratinised epidermal cells generated by the terminal papillae of the dermal laminae. 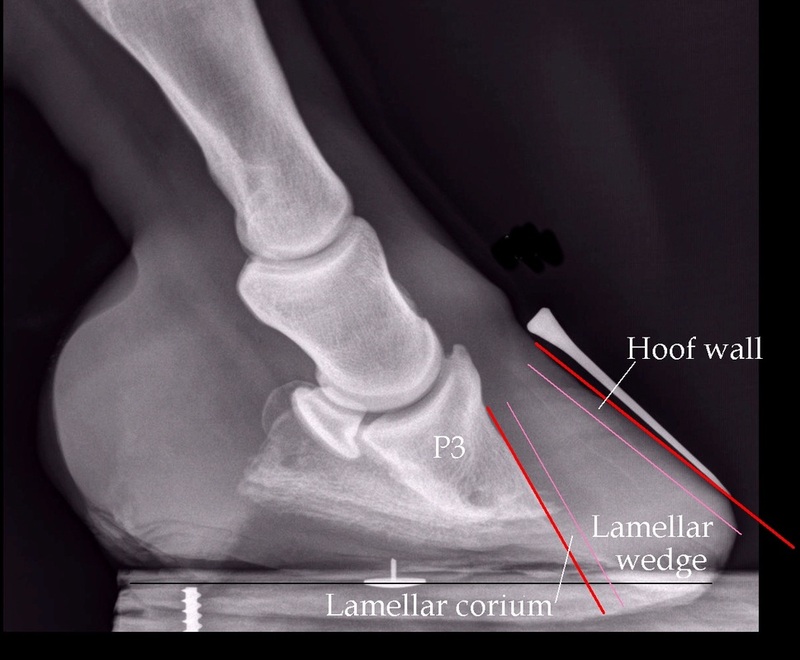 See page 7 of Update on the anatomy of the inner hoof wall by Chris Pollitt for a diagram showing the terminal papillae of the dermal laminae (lamellae). ​Bruising is caused by a trauma such as a blow or impact that ruptures underlying blood vessels, causing blood to escape into the surrounding tissues. The trauma that caused the bruising may have happened weeks or even months before the bruising is seen at the outer surface of the hoof. 1. Laminitis - red or pink areas of bruising, or pockets of dried blood or serum (yellow) can be seen in the white line following laminitis. If the white line is stretched, this may be more suggestive of the bruising being as a result of laminitis. 2. Anything that results in overloading the toe/toe first landing e.g. heel pain, high heels, upright feet, long toe/low heel conformation. If the white line is tight, this may be more suggestive of the bruising not being associated with laminitis. 3. Long toes that cause increased separating forces on the laminae. There may or may not be stretching of the white line. Hard, uneven and/or stony ground are likely to exacerbate bruising of the feet. This article has a photo of blood in the white line at the quarters, and the author says that he often sees blood in the white line in the quarters in early spring, and suggests that it may be due to the winter's icy frozen ground and subsequent concussion, perhaps due to an imbalance, but that the horses showing this blood in the white line are never lame. 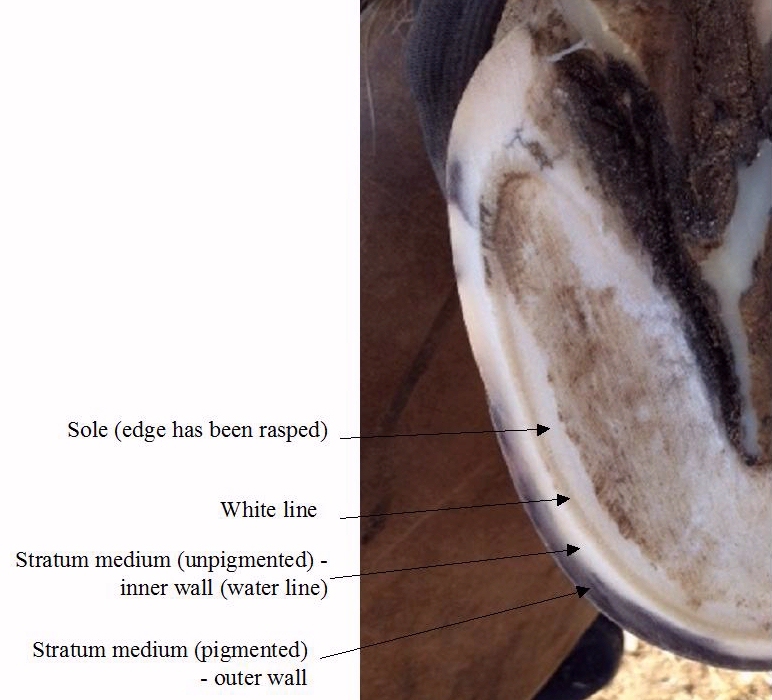 White line disease (WLD) can affect the white line and the stratum medium (inner hoof wall). WLD may be mistaken for an abscess. Using x-rays can help differentiate (a 65 degree DP radiograph may be necessary) - gas shadows adjacent to the blood vessels will indicate an abscess. In Care and Rehabilitation of the Equine Foot (p 337) Pete Ramey suggests that pathogens (bacteria, fungi) rarely affect healthy feet; often a wall crack or white line separation following laminitis allows pathogens to get established. Soak the foot with a solution that kills bacteria and fungi without damaging live tissue (e.g. CleanTrax, White Lightning, 50:50 apple cider vinegar and water) until the problem has fully resolved, and address the cause (diet, trim). Opening the lesion can be effective but may risk damaging the corium. Provide a dry environment, low sugar/starch mineral balanced diet and correct trim - remove flare, bevel walls, ensure the back of the foot is healthy and the horse is landing heel first (keep heels just above live sole, allow frog to develop, use boots and pads if necessary), treat fungal/bacterial infections. Can Vet J. 2003 February; 44(2): 145–146. No more than 50% of the foot should be in front of the widest part (measuring from breakover to the rear most weight bearing structure, i.e. the frog buttress). - by marking an arc on both sides of the foot and seeing where the widest part is/measuring to see where the foot is widest. Looking at radiographs, Ovnicek found that the widest part of the foot was on average 1/4" from the CoA on medium sized feet, and found that the relationship of the CoA with the widest part of the foot depended on the palmar/plantar angle (he found that with a negative to 5 degree palmar angle the CoA was behind the WPOTF, once the palmar angle was 6+ degrees the CoA was in front of the WPOFT).